Suwanee, GA – February 12, 2010 - The Chairman of the NXDN™ Forum recently announced that the NXDN™ Forum and the dPMR MoU have agreed to collaborate on issues of common interest in the promotion of 6.25 kHz FDMA technology. While the two protocols are not compatible with each other, they share the “basic DNA” of being 6.25 kHz FDMA technologies with the purpose of providing spectrum efficiency and the advantages of digital two-way radio. The NXDN™ Forum was primarily formed to promote and maintain interoperability of the NXDN™ digital protocol in North America. The dPMR MoU was formed for a similar purpose in Europe. There has been some confusion in the media and the market regarding the differences between these two industry groups and the technology. Some basic clarifications are as follows. NXDN™ and dPMR (digital Private Mobile Radio) are BOTH 6.25 kHz FDMA technologies. NXDN™ and dPMR are not compatible with each other, as the basic air interface format is different. NXDN™ is an open-proprietary protocol supported by the members of the NXDN™ Forum. dPMR is a European Telecommunications Standards Institute (ETSI) open technical standard supported by the members of the dPMR MoU Goup. A number of leading LMR industry companies are members of both groups. Further details of each organization and the respective protocols can be found on the homepage of each group. The NXDN™ Forum web site : www.nxdn-forum.com . The dPMR MoU web site : http://www.dpmr-mou.org . 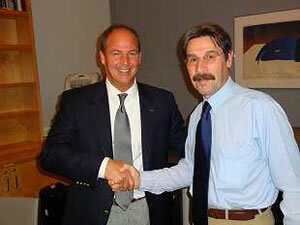 The Chairman of the NXDN™ Forum, Mr. Mark Jasin and the Chairman of the dPMR MoU, Mr. Peter Hizzey meet in New York. The NXDN™ Forum was established in July, 2008, and currently has a membership of 13 companies from the Land Mobile Radio industry. These members include Kenwood Corporation, Icom Incorporated, Kenwood USA Corporation, Icom America Incorporated, Aeroflex Wichita Inc., Daniels Electronics Ltd., Ritron Inc., Trident Datacom Technologies, Inc. d/b/a Trident Micro Systems, Anritsu Company, CML Microsystems Plc, Etherstack Ltd., General Dynamics SATCOM Technologies and Meteor Communications Corporation, Inc. The dPMR MoU was establish in February, 2007, and currently has a membership of 10 companies from the Land Mobile Radio industry. These members include Kenwood Corporation, Icom Incorporated, Aeroflex Wichita Inc., CML Microsystems Plc, CTE International, Etherstack Ltd., Fylde Micro Ltd., Shenzhen HYT Science & Technology Co., Ltd, Sicomm and Unication.